Siemens Micromaster 420 6SE6420-2AD31-1CAL 0 to 550 Hz, 11 kW AC Drive. Tested! 47 to 63 Hz Input, 3 Phase 26 A, 0 to 550 Hz Output, 11 kW. New open box, on hand and ready to ship!. 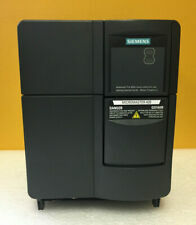 This sale is for a Nice Siemens Micromaster 420 Drive Model 6SE6420-2AB15-5AA1. Unit is a good working pull. MicroMaster 420. Used Cut Out. Missing Cover. Made in United Kingdom. We apologize in advance for any inconvenience this may cause you. The color of the photo may vary from the actual product due to translation and reproduction limitations of photography. 12/12/2014 HE. Output frequency MIN (Hz) 0 - 650. rated imput current (A) 6,6. Rated output current (A) 3,9. Professional advise and any technical problem will be provided. We believe ourWide Product Range will be your selection. Unit is factory sealed. The unit appears to be new and unused by the previous owner. Overall the unit appears to be in excellent, new, ready to use condition. The unit includes everything shown in photos. Micromaster 420 AC Drive. Part # 6SE6420-2UC17-5AA0. Outputs: 0-200-240V, 3.9A, 0-650Hz. Manufacturer: Siemens Micromaster 420 Inverter Model: 6SE6420-2UC22-BA1 Watts: 2.20kW Voltage: 200-240 AMP: 20.2/11.7 *See Photos for more details. SIEMENS MICROMASTER 420 6SE6420-2UD17-5AA1 DRIVE *NEW IN BOX*. MICROMASTER 420 standard AC drives provide the perfect combination of flexibility, performance, and ease of use. Right out of the box this drive is ready to run. less-demanding applications. This flexibility makes this. Model: MICROMASTER 420. Part Number: 6SE6420-2UD25-5CA1. Notes: Does not include stand. Sold as-is, as pictured. SIEMENS MICROMASTER 420 6SE6420-2AB15-5AA1 INVERTER DRIVE *NEW IN BOX*. Model: MICROMASTER 420. Part Number: 6SE6420-2UD17-5AA1. Notes: Does not include stand. Sold as-is, as pictured. 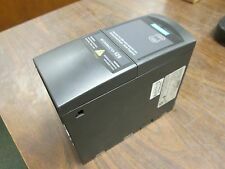 SIEMENS MICROMASTER 420 6SE6420-2UD13-7AA1 DRIVE 380-480V (AS PICTURED) *USED*. Siemens Micromaster 420. Condition is Used. Removed from working cabinet.